All On Focus: Roll the dice. 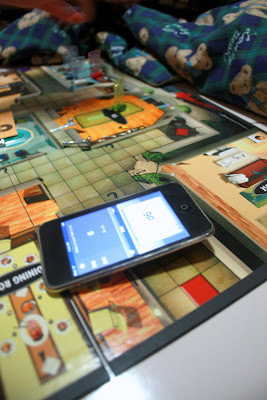 Playing cluedo just got more hi-tech. And no, the games stays the same(we are not finding the murder through state of the art technology.) 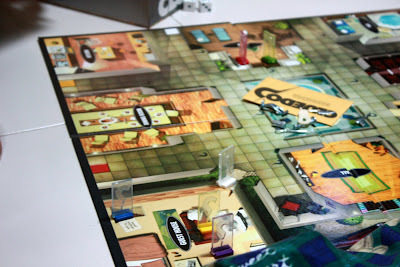 But, the process of finding out clues just got more fun! We no longer need to use the dice to move about the different rooms! You'll see what i'm talking about: I got a new ipod touch joining to my gadget family about a month ago and her name is terylene! Super happy to own this little thing that can serve the net and allow to watch movies and listen to music on the go, what's more, it totally look like a iphone. I kinda pretend it is one! Back to the topic: I installed a roll dice application which you have to shake my ipod to roll the dice. How fun is that! 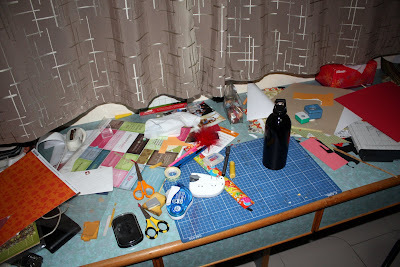 Still, not forgetting that I have a huge mess left at my table and I haven't clear it at all. Plus, you are looking at part of it only! 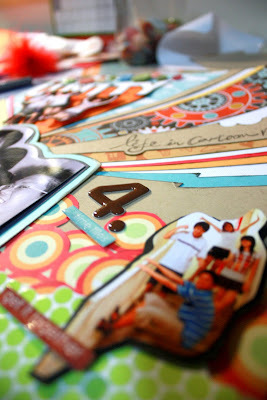 Sigh, where is the technology to put my tools back into my drawer, throw my itsy bitsy scraps away, sort the bigger scraps into my scraps folder by colour and arrange my table nicely? It probably will be up to me then.